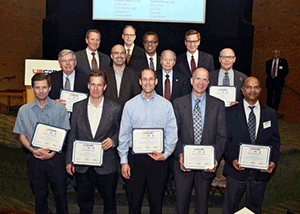 Tim Bays (far right, middle row) was part of a team awarded for its contributions to advancements in future fuels. Along with a group of teammates made up of researchers from various organizations, PNNL chemist Tim Bays was recently recognized for contributions to advancements in engine efficiency and future fuels. The United States Council for Automotive Research (USCAR) presented a Team Award to the members of the U.S. DRIVE Advanced Combustion and Emission Control (ACEC) Fuels Roadmap sub-team for their exceptionally collaborative efforts. The 18 teammates leveraged their diverse organizational background, knowledge, experience, and outlook to create forward-looking guidelines for future fuels. These guidelines will be valuable as members of USCAR and U.S. DRIVE aid in developing upcoming fuels and engines. In addition to Bays, members of the team included staff from Argonne National Laboratory, National Renewable Energy Laboratory, Oak Ridge National Laboratory, Sandia National Laboratories, Fiat Chrysler Automobiles (FCA), Ford Motor Company, and General Motors. The team met bi-monthly from late 2014 to early 2016. In those 14 months, they developed a set of desired fuel property constraints for use in current and next-generation gasoline and diesel engines. “We expect that adopting these property constraints will assist the petroleum companies as they provide fuels that increase engine performance and protect after-treatment systems, while improving fuel economy and reducing vehicle emissions,” Bays said. The roadmap also included a draft position statement on future fuel properties for improved engine efficiency and emissions, which can be used to guide the DOE Co-Optimization of Fuels & Engines (Co-Optima) initiative. The team collaborated with the U.S. DRIVE Fuels Working Group to align the development of roadmaps for future fuels development. Bays started at PNNL in 1997 as a post-doctoral researcher after graduating with his Ph.D. in Organometallic Chemistry from the University of Idaho. His B.S. in Chemistry is from the U.S. Naval Academy. He left PNNL in 1999 to teach at the U.S. Military Academy at West Point. Since returning to PNNL in 2005, Bays has filled roles from researcher to project manager. He is currently an individual contributor to an Office of Vehicle Technologies Unconventional Fuels Project under the Co-Optima initiative. Bays’ research interests include unconventional fuels, lubricants, sorbent materials, and trace detection. Prior to his career in chemistry, Bays served on active duty with the U.S. Navy, and has since served as a drilling Navy Reservist in a variety of units, most recently with the Office of Naval Research. From 2009 to 2010, Bays was mobilized by the Navy to Iraq, where he served as a liaison between the U.S. Embassy, the U.S. Navy, and the Government of Iraq.